Top of cul-de-sac privacy and views. Attractive three-bedroom, two-bath, 1440 sf manufactured home built in 1991 sits on its own 7400 sf lot. Step into the spacious living room with vaulted ceilings, a wood-burning rock fireplace and glass doors to the back deck. A spacious country kitchen features tile counters and oversized windows to take in the stunning oak covered skyline while dining. The master bedroom is at the back of the house and features mirrored closet doors. The master bath has a double door entry with a soaking tub in addition to a stall shower. Both baths feature tile flooring. The separated floorplan features two nice bedrooms and a full guest bath on the opposite side of the home along with the indoor laundry room. Central heat and air conditioning plus dual pane windows for year-round comfort. 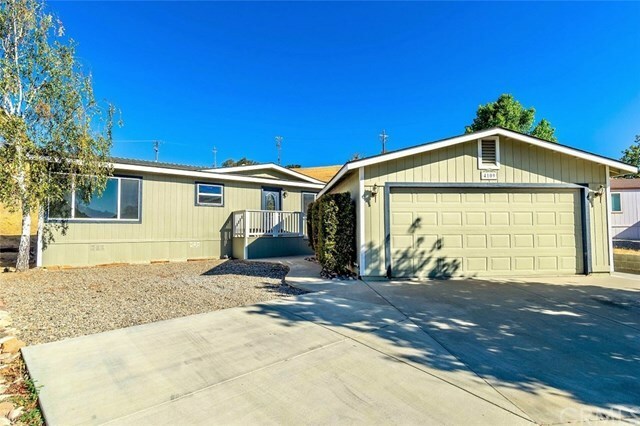 This home has been refreshed with new paint inside and out as well as all new carpet and flooring. Plenty of parking is available with an ample driveway in addition to a detached two-car garage. Enjoy the private courtyard between the garage and the house or the covered deck in the rear backed to greenbelt. This home is located in a great neighborhood and it is move-in ready. It is priced for a quick sale and qualifies for FHA, VA or conventional financing.